Players Aid sheet, 1- unit record sheet, and 1-sheet of game tables. These were some of the responses offered about: A SIMPLE CIVIL WAR GAME © from purchasers. 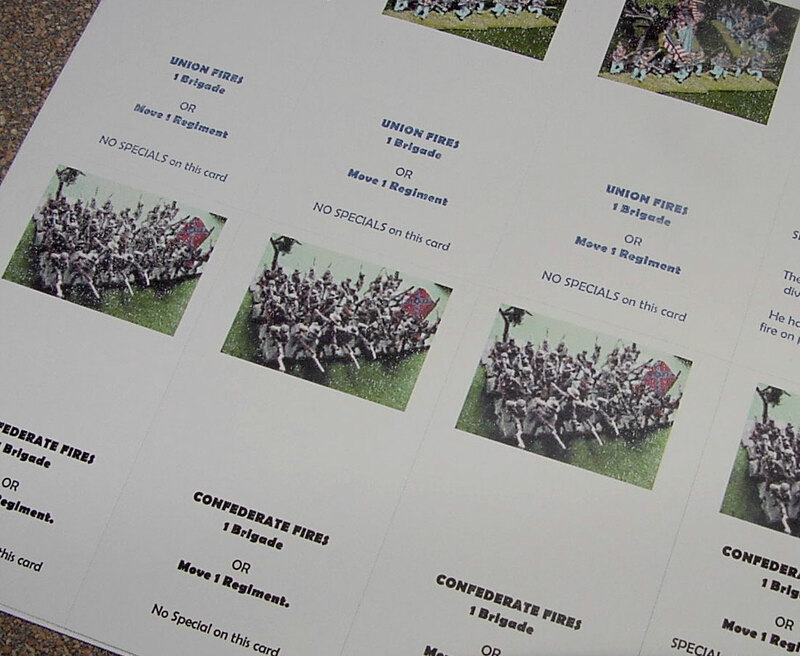 “Just got the rules for "A Simple Civil War Game" and they look good. Nice job on the graphics!! !...” & “… I showed the game to some fellow war gamers, and they seemed to like your approach…” said Bob O'H… in an e-mail received in JAN 2005. "OUTSTANDING GAME! and the troop lists are great to have. Very Satisfied"
said 'hamwarleigh (81)' in E-bay feedback received in Oct, 2004. "WOW! Very nice game! Good Price! Great Service! Thank you!! said 'jusdoit7 (73) in E-bay feedback received in Sept., 2004. This simple tabletop game can be played with any Civil War miniatures you may have, or with something as simple as a set of wooden blocks painted blue and gray. 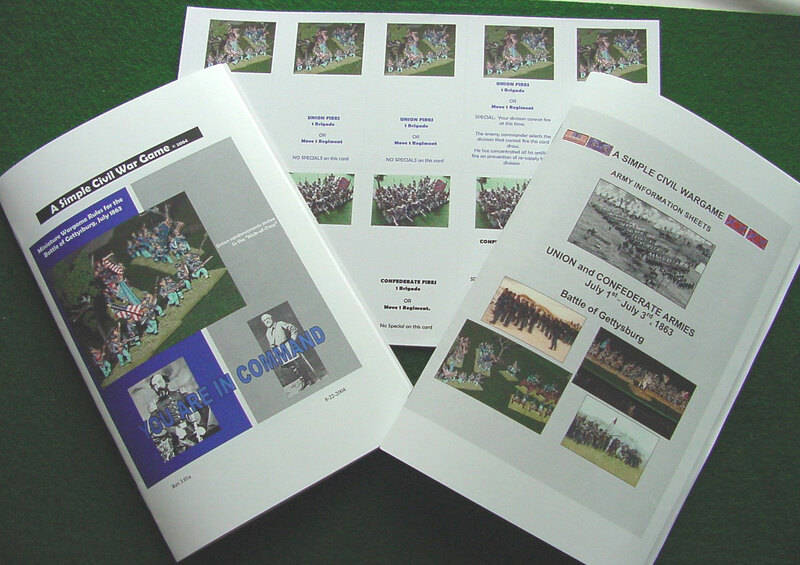 Movement, combat, and morale are based (and modified) for the levels of command. In these rules, leaders can make a real difference when units of equal capability and morale meet on the table-top. Card draw effects movement, combat, and time. 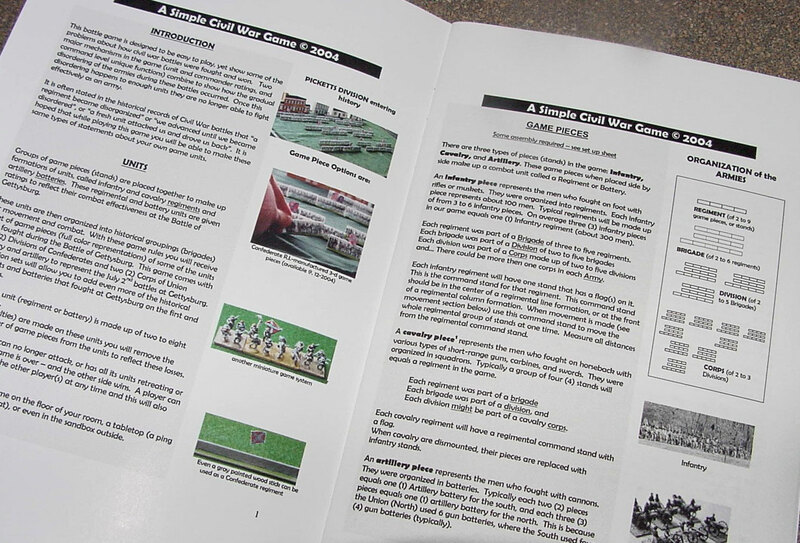 The 16-page rule book is easy to learn as the rule is on the left side of the page, and a photo, illustration, or highlight is on the right side of the page to clarify that rule or statement. 1-set of 50 cards that control time, firing, movement, and “special situations” that might occur during a table-top battle. Each cycle of the deck is “1-hour” of game time. These rules can use any of your existing miniatures, stand size makes no difference as long as both sides are mounted the same. If you do not have miniatures, or do not want to paint miniatures, a product called “ACW Paper Armies” is available for both sides. Individual “stands” show infantry, cavalry, artillery, commanders, wagons, and limbers in full color overhead photos.